Hubble reveals dynamic atmospheres of Uranus, Neptune. The presence of a massive white cap on Uranus may appear to be disturbing, yet as planetary scientists are learning, this is the thing that a drawn-out summer looks like on the remote ice giant. 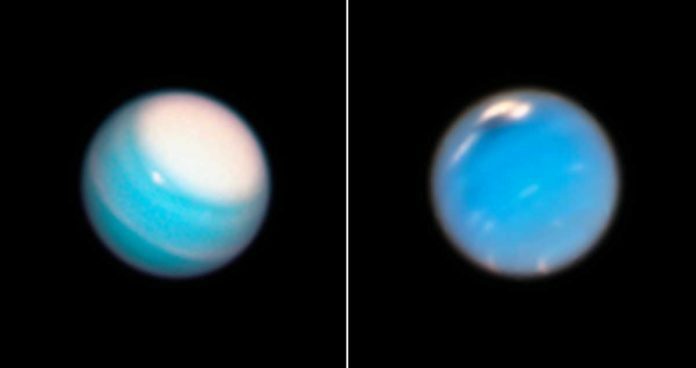 Ice giants Uranus and Neptune have water-rich interiors covered with hydrogen, helium, and methane, the last of which gives these external planets their particular cyan complexion. In contrast to Earth, where seasons last only a couple of months, Neptune and Uranus experience seasons that keep going for quite a long time, bringing about weird and intense atmospheric phenomena. Recently, the Outer Planet Atmospheres Legacy (OPAL) program has released new images that highlight an evolving atmospheric event on both ice giants, namely an extended white cap over Uranus’ north pole and a new dark vortex on Neptune. The new data, captured during the autumn of 2018, are providing important new insights into the seasonal variations on both Neptune and Uranus. Patrick Irwin, a planetary scientist at Oxford University, said the phenomenon is not a storm, as NASA described it in its release. Rather, it’s caused mainly—at least in our models—by a lowering of the methane abundance above the main cloud deck accompanied by a possible slight increase in the haze opacity. Observing Neptune image, it gives the idea that a dark vortex has once again raised its ugly—yet captivating—head. The new anti- cyclonic tempest, seen at the best focal point of the photograph above, is around 11,000 kilometers (6,800 miles) over.